Two-thousand-and-thirteen, whilst something of a banner year for Polish dry bulk ports, proved a much more difficult challenge for those in Latvia, writes Barry Cross. Poland’s Port of Gdynia saw dry bulk traffic rise by 16% last year, from 5.127mt (million tonnes) in 2012 to 5.943mt. Coal and coke remained the most important commodities, amounting to a combined 2.640mt, compared to 2.050mt in 2012. Grain, similarly, performed well, increasing from 1.782mt to 2.178mt. Others bulks, however, declined by about 13% to 1.125mt. Asked what factors influenced traffic, port authority president Janusz Jarosinski notes that the dredging of the port channel in 2011 was a significant determinant, as was the reconstruction and deepening of the Holenderskie (Dutch) Quay, which allowed larger vessels to access the port. “Moreover, all bulk terminals in the port have been privatized, which has led to the acquisition of new clients with larger cargo volumes and also to the introduction of new management styles and efficiency. New cargo handling equipment has also been acquired. All of these are contributory factors, explaining why dry cargo traffic is in the ascendency,” he says. of cargo turnover and this was true for all cargo types. The only major decrease was in imported aggregates, which Jarosinski explains was due to the completion of the A1 motorway and other construction works. “We expect results in 2014 to be similar to those in 2013 and all indications from the beginning of the year show signs of improvement over last year’s results. Generally, we are now expecting growth of 3–5%, which is in line with Poland’s forecast for GDP growth,” he says. Current capacity at Gydnia can sustain any increase in cargo volume for the next few years. However, terminal operators have plans to construct new warehouses in the near future. Indeed, two new warehouses are currently under construction. In addition, reconstruction work is also ongoing on the Szwedzkie (Swedish) Quay, deepening the available draught to 15.5 metres, which will make it possible for Baltmax vessels to access the port by 2020. The earlier deepening of the draft meant that the port was able to receive Capesize vessels as of 2011. Among ships that have visited the port after the dredging are the Linda Fortune, Cape Fortune and Capri. This means that, nowadays, Gdynia, can handle the largest ships able to enter the Baltic Sea. transport of goods to and from the port. All movements of coal, coke and fertilizer, for example, is undertaken by this mode. Even though grain and fodder is mostly handled by road transport, a recent trend has been for larger volumes of these cargo types to switch to rail for longer hauls. “We expect this trend to grow, especially for transit cargo to/from neighbouring countries when the new Adriatic–Baltic Rail Corridor is fully operational. Moreover, completion of renovation work on the E65 line from Gdynia to the southern parts of Poland and beyond will give a significant boost to rail traffic,” he says. In terms of being able to add value, Jarosinski points out that, based on the wishes of the port’s clients, all terminals have the capability of further processing dry bulk commodities, if this is required. Finally, asked about productivity, he says that handling rates at the various terminals varies between 20,000–25,000 tonnes over any given 24-hour period, which he says compares favourably with other neighbouring ports. Gdynia’s Maritime Bulk Terminal (MTMG) reported a 15% growth in dry bulk traffic last year, handling around 6mt of various commodities. This increase, notes account manager Andrzej Grubalski, was down to very good wheat exports and increased coal imports. He concedes that, as a dry bulk terminal, there is also pressure on handling quality and also a need to offer clients added value services. At the same time, MTMG is constantly looking to expand and is currently in an investment process in respect of a new warehouse, which will be able to store an additional 60,000 tonnes of agribulk, using modern, fast discharging technology. is one of our main assets. Most of our coal and coke traffic is moved by train, since rail wagon capacity is higher than that of road trailers, while over longer distances it’s more convenient for our clients to handle traffic by rail,” says Grubalski. In fact, the higher capacity that rail offers over road is important, since MTMG can accommodate partially loaded Capesize vessels at its terminal during discharge operations. Currently, the maximum draft is 13 metres. However, one quay, where draught is limited to 10.5 metres, is being dredged to 13.5 metres, with the possibility of further upgrading this to 15 metres in the future, which would allow the terminal to handle Baltmax vessels. Asked about productivity, Grubalski says that, being able to offer tailor-made services means that the terminal has carved out a strong competitive position in the market. Its main advantages, he stresses, are the draught, which enables it to easily handle Panamax vessels; a fast loading/discharging rate; direct connection to the Polish rail network; plus good road connectivity and expansive on-terminal storage. The Port of Gdansk also had a record 2013, reporting traffic of around 30.3mt compared to the 26.9mt posted the previous year. Nowadays, dry bulk accounts for about 22% of all traffic handled. Although 2013 dry bulk traffic was half a million tonnes lower than that the previous year, there were huge variations in how individual commodities performed. On the up were coal (from 1.92mt in 2012 to 4.59mt in 2013) and grain (from 1.02 to 1.48mt), although aggregate and sulphur volumes dipped (from 4.30 to 2.64mt). “The substantial rise in aggregate imports, which hit a peak of 5.01mt in 2011, were due to extensive road investments prior to the Euro-2012 Football Championship,” notes port authority spokesperson Mr Kasprowicz. He points out that, in future, it will be the new dry bulk terminal in the port’s deepwater harbour, as well as the activity of the company operating at the Basen Górniczy and at the grain quays in the inner port, that will determine future results at the Port of Gdansk. “The envisaged dredging of the port fairway and modernization of the quays on both sides should enhance the profitability of this older part of the port and also streamline the operation of short-sea vessels,” he says. aimed at both loading and discharging vessels. It handles mainly grain and meal, and has comprehensive grain drying technology available, which allows it to process around 45 tonnes per hour, and also a cleaning facility, capable of processing 150 tonnes per hour. In 2013, the Dry Bulk Terminal located on the deepwater pier at Port Pólnocny, in Gdansk’s outer harbour, was also completed. The existing coal terminal handling facility, which had a productivity of 50,000 daily tonnes, was joined by a second facility aimed at imported cargo, which could load either trucks or rail wagons at the rate of 30,000 tonnes in any given 24-hour period. “This terminal is fitted with automatic wagon de-icing and unloading equipment, as well as facilities for sorting, storing and loading bulk carriers. There are also two 75-tonne cranes, supported by dumping and loading machines, as well as a conveyor system capable of handling 4,000 tonnes per hour,” says Kasprowicz. In addition, the deepwater terminals are backed up by crude ore and coal quays at Basen Górniczy, which have been operating since the inter-war period. These can berth ships drawing up to 10.2 metres of water. Around one-third of the port’s traffic — liquid bulk — flows by pipeline, with container and dry bulk traffic split fairly equally between road and rail. Kasprowicz characterizes road access as “excellent”, although notes that the rail network needs the implementation of a number of key projects that would upgrade infrastructure linking Gdansk with both the south of Poland and with border crossings to neighbouring countries. “The most significant project for us would be the new railway bridge over the ‘Dead Vistula’ river and the double-track railway to Pruszcz Gdanski, which is where the main railway line connects with Silesia,” he says, noting that this latter forms part of TEN-T Corridor 1. The EU has promised subsidy and, if everything goes to plan, they should be in place by the end of 2015. 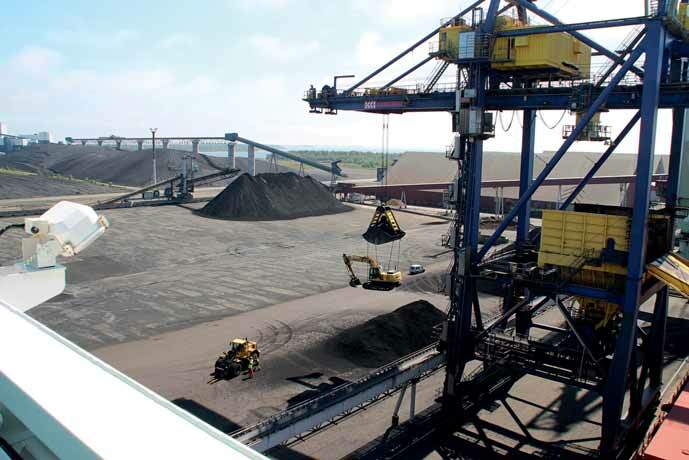 With such vast volumes being handled, Kasprowicz stresses that processing of coal, coke and aggregates does take place in the port, since the market requires these in a variety of different forms. Processing these raw materials has therefore become a profitable activity, he notes. Quizzed as to vessel sizes, he notes that at Port Pólnocny’s deepwater quays, it is not uncommon to see 100,000dwt bulk carriers docked. Meanwhile, at Basen Górniczy and the grain quays, smaller vessels of up to 40,000dwt are the norm. “Vessel sizes are in line with market needs around the Baltic,” he says. In stark contrast, at the Port of Tallinn, port authority business manager Margus Sitsi told DCI that volumes of dry bulk are not as good as they would like them to be. Last year, for example, there was a 20% decline in dry bulk, from 4mt to 3.2mt. Dry bulk handling takes place at two different locations: Muuga Harbour and Paldiski South Harbour. The former is mainly orientated towards transit traffic from Russia and Kazakhstan. “We have much more free capacity for dry bulk in Muuga than we currently handle,” conceded Sitsi. The specialized coal terminal, for example, can handle up to 5mt annually, while the grain terminal could, theoretically, handle 5mt of imports and 2.5mt of exports. In addition, the fertilizer terminal has a 2.5mt annual capacity. The draught, however, is excellent, being 17 metres alongside the quayside. As for the Paldiski South Harbour, this is used mainly for Estonian imports and exports. Main commodities are scrap metal, crushed stone, peat, woodchips and pellets. There is also some transit of scrap metal, which is transported to the port by smaller vessels and then reloaded onto Handymax size vessels. Dry Bulk Terminal Muuga (DBT) also had a disappointing 2012, when it handled 1.7mt of dry bulk, compared with 2.4mt in 2012, which was its best ever year since starting operations in 1998. As a benchmark, it should be noted that the average cargo traffic over the last ten years has been around 1.7mt annually. DBT’s main traffic, fertilizer, was adversely affected last year by the global drop in price for this product. She explains that traffic is determined by various market factors. For example, last year, the price of urea dropped to a level whereby the cost price — because of high purchase price of gas — made production unprofitable. As a result, the only local (Estonian) fertilizer producer was forced to suspend production in the autumn. “Their export freight deliveries through our terminal therefore declined too, which is significant in that they have an annual volume of around 200,000 tonnes. We don’t expect them to restart production before the spring, all of which negatively impacts on traffic,” she says. Because DBT is a specialist facility, designed to handle mineral fertilizer, it is therefore difficult for it to seek alternative commodities to offset the decline in its core business. Despite recent difficulties, in June 2012, construction began of three new dome-type warehouses with a total capacity of 27,000 tonnes. These were inaugurated in September 2013, allowing storage at DBT to increase to 192,000 tonnes. As each of the domes is independent, they provide maximum product segregation, ensuring no product cross-contamination and giving the terminal the ability to guarantee that quality and commodity properties will not be damaged in any way. Rail plays a significant role in the movement of mineral fertilizer in Estonia. Railways, notes Jurjeva, have several advantages over other modes, namely high capacity, reliability and relatively high speed. “Our main clients are big fertilizer producers in neighbouring Russia and so rail is very important to our business. In general, fertilizer is transported by rail from the main manufacturers for onward shipment by sea to Central, South and North America, Europe, Asia, Africa and Australia,” she says. However, during the transit, it is possible for DBT to add value to the basic product being handled, with both bagging and blending services offered on-site. The blender uses a continuous process, being equipped with four hopper compartments. Each hopper is mounted on a digital scale and is fitted with an automatic dosage correction system, which ensures high dose accuracy, guaranteeing that the end-product blend meets the customer’s specifications. As for bagging, there are two FIBC (big bags) filling stations, capable of handling 500–1,250kg big bags. Physically, DBT is able to operate all year round, since Muuga Harbour is ice-free and there are no draught restrictions in the port. The terminal has a 288m quay with alongside draught of 14.5m, allowing Panamax bulk carriers to berth. However, market changes last year resulted in an absence of large shipments of phosphate fertilizer (DAP, MAP) to Pakistan and India, resulting in a reduction in the size of consignments. In general, loads of 30,000–35,000 tonnes are despatched to Latin America, Africa and India, while the European average is in the 3,000-5,000-tonne average. However, vessels en route to China invariably load up to 70,000 tonnes. The average DWT, calculates Jurjeva is around 30,000 tonnes, while the largest is 82,000 tonnes. Quizzed as to productivity at DBT, she notes that the terminal has no direct competitors in Estonia specialized in transshipment of bulk fertilizer. However, in the wider Baltic Sea region, there is a lot of competition, with terminals equipped with transshipment and warehouse capability, as well as modern equipment and infrastructure. Despite problems in Estonia, in neighbouring Latvia, Riga Fertilizer Terminal opened for business on 18 December 2013. It is a joint venture between Urlalchem and Riga Commercial Port (RTO) and is dedicated to the handling and short-term storage of bulk fertilizer. The two companies originally signed an agreement in 2009, with the project being implemented by Riga Fertilizer Terminal Limited, 51 % of which is owned by the Uralchem holding company and 49 % by RTO. The total investment in the project exceeds €60 million. At start up, the terminal has a annual capacity of 2mt. Dmitry Konyaev, general director of Uralchem, adds that the new terminal will strengthen the position of Riga as a major European port and enhance the development of the city as an important North European transit hub. The terminal, stress the owners, has been built using the most up-to-date environmentally friendly technologies and materials. It also meets the most stringent EU requirements for safety and environmental impact. Furthermore, all cargo handling operations are carried out in enclosed facilities that are completely isolated from the external environment. On 1 January 2015 — only a few months from now — there will be drastic changes taking place in the Baltic Sea Area. Just how drastic these changes will be is uncertain. It is very difficult to make accurate predictions; nevertheless, the Port of Pori has readied itself for 2015. The Baltic Sea, the North Sea and the English Channel form European SECA Area (Sulphur Emission Control Area). In the SECA, the highest permitted sulphur content of fuel will fall to 0.1 % from 1 January 2015. In practice, this content level means that there are two alternatives for shipping companies.They can use low- sulphur fuels like LNG (liquefied natural gas), MGO (marine gas oil) or methanol. Alternatively, the ship can be equipped with scrubbers, so that it is able to reduce the sulphur content in exhaust gases totherequiredlevel. Thereis,in fact, also a third alternative. This worst-case scenario is a so-called ‘modal backshift’ from sea to road. All these solutions mean higher logistical costs to the shipping companies, but first and foremost to the shippers. The logistics chain must be considered as a whole, stresses Jaakko Nirhamo, port director of the Port of Pori. Choosing the right port is crucial. The Port of Pori has decided to tackle the economic disadvantages of the sulphur restrictions by using the strengthsoftheportitself. Theses include LNG bunkering facilities, deep fairways, the best ice conditions among the Finnish ports, uncongested hinterland connections, effective port operations and services of the M20 Industrial Park. At the beginning of March, Gasum Oy decided to start a project aiming to build an LNG import terminal for Tahkoluoto harbour. The terminal will be the first in Finland. With a capacity of 30,000m3, the terminal is intended to fulfill the needs of shipping, road transport and industry. The Pori region is one of the most industrialized regions in Finland, and LNG would be a new alternative energy source for the industry. Construction works are planned to start during this year and, if all goes to schedule, the terminal will commence operation in autumn 2016. Excellent fairways and land transport connections have long been a trump card for the Port of Pori, but their importance will grow further in the new situation caused by the SECA decisions. Deep fairways mean larger vessels and more energy- efficient transport. In Tahkoluoto deep harbour, water under the keel doesn’t run out. The depth of the fairway is 15.3 metres, the same depth as the Danish Straits. This means that all vessels that are able to pass through the Danish Straits can call at the Port of Pori. The fairway is the deepest at the Gulf of Bothnia, the sea area between Finland and Sweden. Tahkoluoto is thus a dry bulk hub in the Gulf of Bothnia area. In Mäntyluoto harbour, there is a new 12-metre berth and fairway for Panamax vessels. For example, 3,500 TEU container vessels can be handled in Mäntyluoto. Finland is famous for its archipelago, but not Pori. It has other tourist attractions. The fairways are easy to navigate. Not even winter conditions constitute a challenge. Ice-breakers are rarely seen in Pori. Short fairways from the open sea to the harbour and the best ice conditions in Finland mean lower bunker costs, fairway dues and pilotage fees. Uncongested land transport connections save fuel and wage costs. Main Finnish industrial areas and the largest cities can be reached within three hours by road. From the Port of Pori, there is also a railway connection to Russia. Finland has the same railway gauge as Russia. Rail wagons only need to be loaded or unloaded once. Extra lifting costs are not incurred. Only the engine is changed at the border. The best solution to avoid land transport costs is to settle in theM20IndustrialPark. TheM20IndustrialParkoperatesin the immediate vicinity of the Port of Pori. The industrial park is being developed into a node with excellent traffic connections to all over Finland as well to Russia, Scandinavia and Continental Europe. The area is one of the few industrial and logistics areas in the Baltic Sea Region that still offers space for growth to both SMEs (small and medium enterprises) and large companies right next to a well-functioning general port. The traffic and infrastructure of the Port of Pori support companies and their growth. There are over 200 hectares of vacant land for industry, logistics companies and value-added services. From the energy-efficiency viewpoint, larger vessels are key factors. But vessels must also have full loads in both inbound and outbound directions. This is, in the first place, a matter for shippers and forwarders. To prevent a modal backshift, co-operation must be increased. The port can foster such co-operation by offering favourable infrastructure and services. The Port of Pori has competence in handling all kinds of cargo and vessels. This means that both raw materials and different semi-finished and end products can flow via the port. There are prerequisites for combined cargo, and these increase the load factor of vessels. The Port of Pori is taking part in the Bothnian Green Logistics Corridor project, part-financed by the European Union. The aim of the project is to connect northern Scandinavia’s raw materials with the markets in the Baltic Sea Region and Central Europe. Also east–west connections from the Norwegian coast to Russia via Sweden and Finland are in focus. Norwegian partners are situated north of the SECA area. How much the SECA area will affect the cargo flow remains to be seen. The importance of the northern sea areas will grow in any case. Better east–west connections are needed. As a part of the east–west connections, the Port of Pori has made a study of re-opening the Pori–Haapamäki railroad line, which would open a new route to the Finnish mining areas, but also a new route to Russia.